Bloomingdale’s was founded in 1861 as a luxury hoop skirt shop in Manhattan. Macy’s-owned Bloomingdale’s has since risen in the ranks of designer retailers. Bloomingdale’s has expanded to over 40 stores and 13 outlets throughout the U.S. today. The company’s slogan is “Like no other store in the world.” This offers a glimpse into the incredible fashion, handbags, and accessories Bloomingdale’s offers. Despite the small number of Bloomingdale’s brick and mortar locations, Bloomingdale’s brings in over a billion dollars in revenue each year. This is supplemented by their booming online store. Do you have a taste for flair and designer styles? 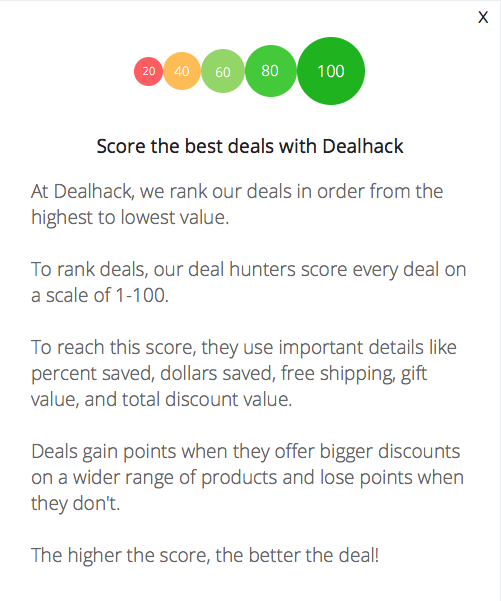 Our coupon experts here at Dealhack love finding the best online coupons and promo codes. We have all the best listed right here on this page. Do you want to learn more about how you can save at Bloomingdale’s? Then here are a few tips for successfully navigating Bloomingdale’s online selections. Bloomingdale’s sells upscale clothing, jewelry, handbags, beauty items, and shoes for men and women. Brands range from kate spade new york and Burberry to Michael Kors and Vince. There are thousands of items for sale on the Bloomingdale’s website at a time. You’ll often find seasonal sales highlighted at the top of the homepage. If you sign up for the Bloomingdale’s email newsletter, you’ll get 10% off your first purchase. Find the box at the bottom of the homepage to sign up before completing your first online order. Always be sure to check this page before you shop for the best Bloomingdale’s coupons and promo codes. In Bloomingdale’s Sale section, you’ll find everything from apparel to home items on sale. You can shop by category and find over 20,000 discounted designer items that are sometimes on sale for more than 50% of their retail value. Bloomingdale’s also hosts occasional clearance events where you’ll score even more discounts. Get savings up to a massive 70% off the retail value. Just click “Promotions Happening Now” under the Sale tab on the Bloomingdale’s website to discover the latest deals. Bloomingdales.com also has its own Outlet section. You can find a variety of well-known clothing and accessory brands like Lucky Brand, Ivanka Trump, Deux Lux, MIA, and many more. Bloomingdale’s also has an online exclusive offer for outlet shoppers. Get a $20 coupon for purchases of $100 or more when you sign up for the Outlet emails. Easy, right? It’s also perfect for staying on top of the latest frugal and fashionable trends. The Bloomingdale’s outlet adds new items every single Friday. Bloomingdale’s offers a store credit card and a Bloomingdale’s-branded American Express card. Plus, find two upgraded options for the store and Amex cards, which are called “Top of the List.” You can apply for the Bloomingdale’s store card online to qualify for free shipping everyday. You will also receive 3 points for every $1 spent at Bloomingdale’s in-store or online. If you purchase cosmetics, fragrances, or shoes, you’ll earn 6 points for every $1 spent. This card also enrolls you in the Loyallist program. The downside is that 75% of the points remaining on your card at the end of the year will be forfeited. The APR is pretty high for a card that you can only use at Bloomingdale’s – 25.49%. However, if you spend more than $3,500 per year at Bloomingdale’s, you could be upgraded to the Bloomingdale’s Credit Card at the Top of the List. This increases your point earning opportunities from 3 to 4 (per dollar spent) on general purchases. This also increases point earnings from 6 to 8 on fragrances, cosmetics, and shoes. This upgraded card also comes with free local delivery and triple points days. Do you want a card with more usage opportunities beyond just shopping with Bloomingdale’s? You could opt for the Bloomingdale’s American Express card (must apply within the store). Not only do you earn points on Bloomingdale’s purchases with this card, but you also get access to 4 points per dollar spent at gas stations and restaurants as well. All other non-Bloomingdale’s purchases accumulate 2 points per dollar spent. Bloomingdale’s customer loyalty program is called Loyallist, and it’s free to sign up for. You can get free shipping with no minimum purchase on items bought on Bloomingdales.com. Plus, get 1 point per dollar spent in-store or online, double points on shoes, fragrances, and cosmetics. Plus, receive a $25 gift card whenever you rack up 5,000 points. Non-Loyallist customers qualify for free shipping when they purchase more than $150 in a single order. Otherwise, shipping ranges from $6-13 for standard shipping to U.S. addresses (including territories and military addresses) or $11-18 for same-day delivery. International shipping rates vary, but Bloomingdale’s does ship to over 100 countries worldwide. For returns, Bloomingdale’s has a generous 365-day return policy. This means you have a full year to return an item starting from the day you first received it. All you have to do is either return in-store or return via mail by printing a shipping label online. Pack your items (which must be in “saleable condition”) in a box, then drop it off at a UPS location. Bloomingdale’s is active on Instagram, Pinterest, Twitter, and Facebook. They usually advertise new product offerings, seasonal trend items, and fashion advice. Just be sure to check here first as we have the latest coupons and exclusive online offers right here on this page. If you run into any problems on Bloomingdale’s website, contact the customer service anytime. Contact customer service 24/7/365 by calling 1-800-777-0000. You can also search for your question online to see if other customers have experienced the same problem. Find solutions from Bloomingdale’s team of customer service representatives. Are you ready to save on your order today? Grab a coupon from this page and start saving when you shop online. Pay less for your online order when you visit Dealhack first! Why shop in store when you can sign-up for emails to receive 10% off your next order online? That’s just our opinion; we’re always looking for every possible way to save here at Dealhack. Become a Bloomingdale’s Loyalist to earn points on every purchase (and 2x in some categories). Plus, you’ll qualify for free shipping and exclusive discounts. Bloomingdale’s hosts wedding registries. Chat with a personal consultant from Bloomingdales to create the perfect registry. By signing up, you can also receive discounts on dresses and suits to help cut down on costs for that special day. Apply for a Bloomingdale’s credit card and you’ll score these awesome benefits. Do you want to view items from particular designers such Ralph Lauren or Burberry? You can see items from designers from a pull-down menu. The website has a “What’s New” section with new styles and fashions for shoppers. Find out what will be trendy for the upcoming season so you’re always looking up-to-date. A store locator is available on the website if you’re looking for a physical location. What is Today’s Best Bloomingdale's Promo Code? The best Bloomingdale's promo code right now is PRIVATE. This code is for 'Private Sale - Get $25 off Every $100 You Spend on a Great Selection of Regular-price items'. Copy it and enter it on the Bloomingdale's checkout page to use it. Receive free shipping on all orders when you spend $150 or more. Some items are excluded from the free shipping offer, such as gift cards and mattresses. For more information regarding International Shipping or and other questions, view their shipping policy online. You can return any purchase as long as you have your receipt. Certain items cannot be exchanged, such as mattresses, wall art, lamps, mirrors, and Michael Aram sculpture art. For more information on returns, find all of the frequently asked questions here.